Reader Q & A: Should I Drill my Classical Guitar for a Guitar Strap? 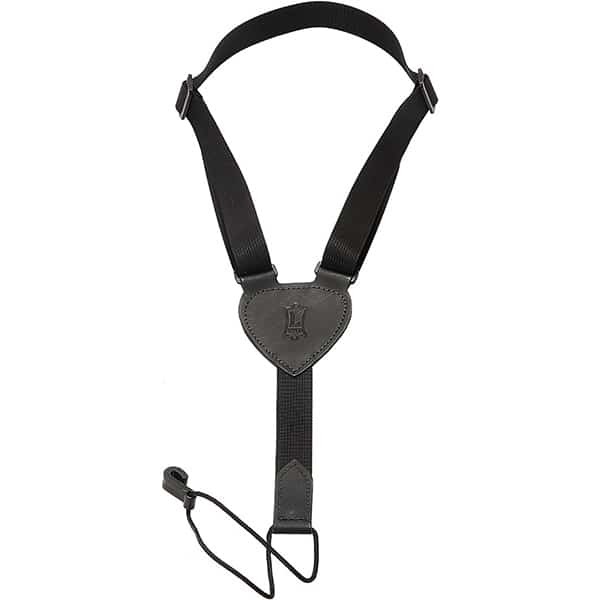 Levy’s Leathers 1 Nylon Classical Guitar Strap. Good, basic, low-cost nylon strap. 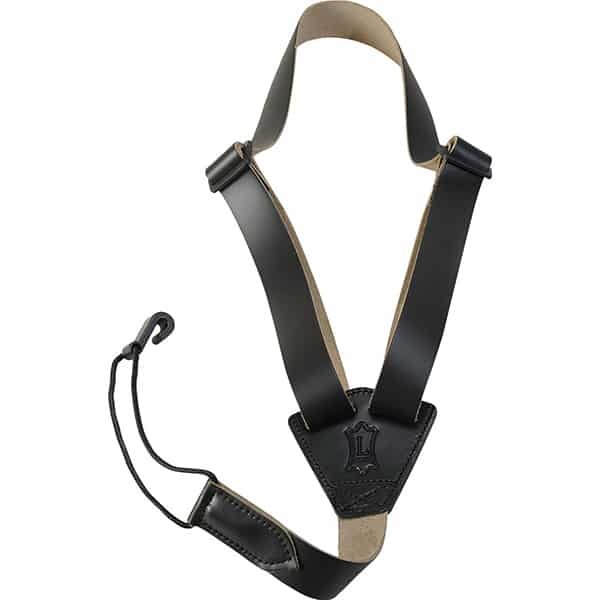 Levy’s Leathers 2 Leather Classical Strap. A great mid-priced leather strap. 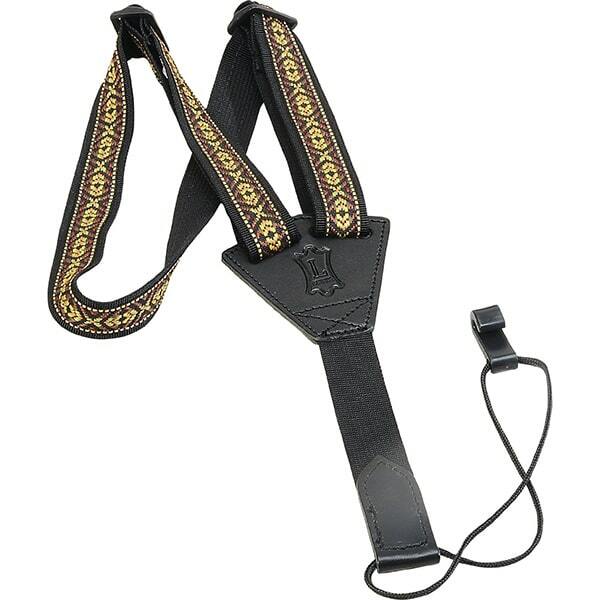 Levy’s Leathers M20JN-002 Classical Guitar Strap. This is a high-end, deluxe strap. Now, a word of caution: with a Classical strap you can’t let go of the guitar with both hands–at any time. One hand must be on the guitar at all times or the guitar will flip out of the strap whenever you’re standing. The upside is that it’s really quick/easy to attach and remove the guitar. Pick it up and hook it underneath. When your done, simply unhook it. You just have to be aware and NOT take both hands off at the same time. The drilling question really comes down to how nice the guitar is. If it’s cheaper and/or you aren’t concerned about devaluing it, you can definitely have a guitar tech drill a couple strap button holes. I’d never do this to a good Classical guitar, but I wouldn’t hesitate to do it to a cheapo one. You just have to make sure it’ll balance right first. In other words, you might drill holes and install strap buttons only to find that it “neck dives” because the center of gravity is off and the neck + headstock keep heading toward the floor. You definitely don’t want that. 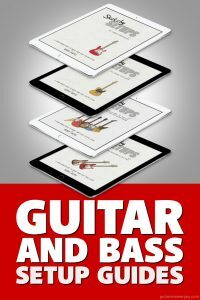 https://www.guitaranswerguy.com/wp-content/uploads/2015/12/hdr_drill_classical.jpg 317 833 Guitar Answer Guy http://www.guitaranswerguy.com/wp-content/uploads/2015/11/logo_170x125.png Guitar Answer Guy2015-12-09 03:33:322019-03-21 16:40:57Reader Q & A: Should I Drill my Classical Guitar for a Guitar Strap? “Action” … a weird word used to describe how high (how far above the wooden fretboard) your guitar strings are. Some people just say “string height” or “guitar string height” as well, which is a bit more specific. Also, you’ll sometimes hear guitar players throwing the term “action” around loosely–to describe the overall playability of a guitar. The higher the action, that harder it’s going to be to press the string down… because the string has further to go before it makes contact with the metal fret. The lower the action, the easier it’s going to be to press the string down, because it’s already closer and has less distance to travel. If you’d like to learn exactly how to measure your string height, as well as see a listing of measurements for what constitutes low, medium, and high action, check out my other article: How to Measure String Height. The main advantage of low action is that the strings are easier to press down. This is great for reducing finger soreness, hand fatigue, and avoiding injury when you’re first learning to play and building strength. As a beginner, you usually want the lowest action possible. However, get your action TOO low and you’ll get a nasty, undesirable buzzing sound with every note (or chord). I’m not talking about the kind of buzzing you get when you’re a beginner and can’t yet press the strings hard enough. That kind of “beginner buzzing” is normal and will go away as you gain skill and hand strength. Buzzing that is a result of excessively low action will happen no matter how great of a player you are, and it can be maddening. 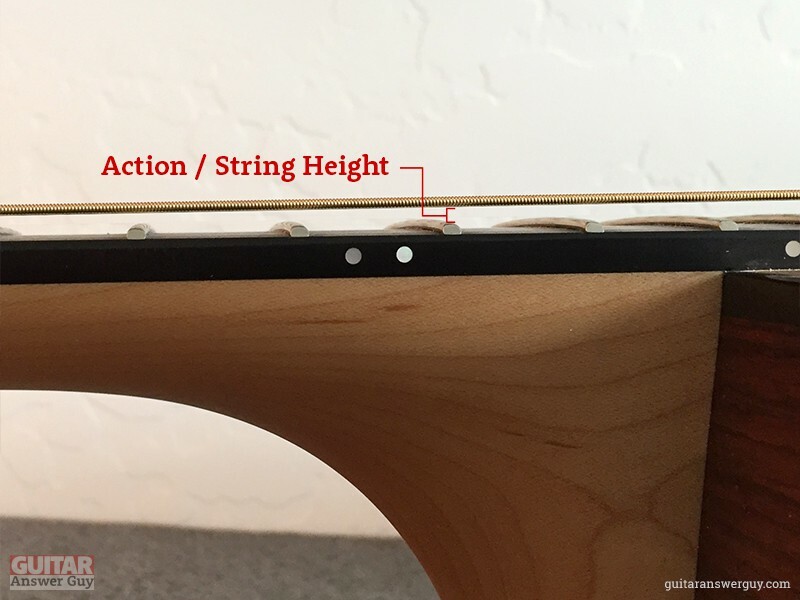 String height or “action” is measured from the top of the metal fret to the bottom of the guitar string. Another potential downside to having excessively low action is that it can lessen a note’s sustain–the length of time a note is audible after you pluck it. Some notes may also “fret out,” meaning they make no sound at all due to obstruction by other frets. I won’t try to explain these last two things, as it would only be understood by professional repair people and advanced guitar players (neither of which are probably reading this article). Now, it IS possible to achieve extremely low action while avoiding or minimizing these issues, but it’s sort of the holy grail for guitar players. Your guitar needs to be expertly set up by a true professional, and may also need a more dramatic (and expensive) procedure known as a “fret level and crown.” As a beginner, don’t worry about the latter right now. I do, however, recommend getting your guitar set up by a pro. If you’re wondering what all goes into a setup, you can ready my article Guitar Setups: What They Are and Why You (Might) Need One. The main advantage to having high action is that your guitar will generally be free of that nasty buzzing I mentioned above. It also allows the notes to sustain freely and naturally, since the string is unobstructed. With high action, having your guitar set up by a pro isn’t as critical. However, if your action is TOO high it becomes extremely difficult to press the guitar strings down. Not only is this just plain painful, your hand will tire much faster and you can actually injure yourself. With action that is too high, you’re more likely to get a lot of that “beginner buzzing” that is the result not having the sheer hand strength to press the strings down fully and firmly (especially when trying to make chords). 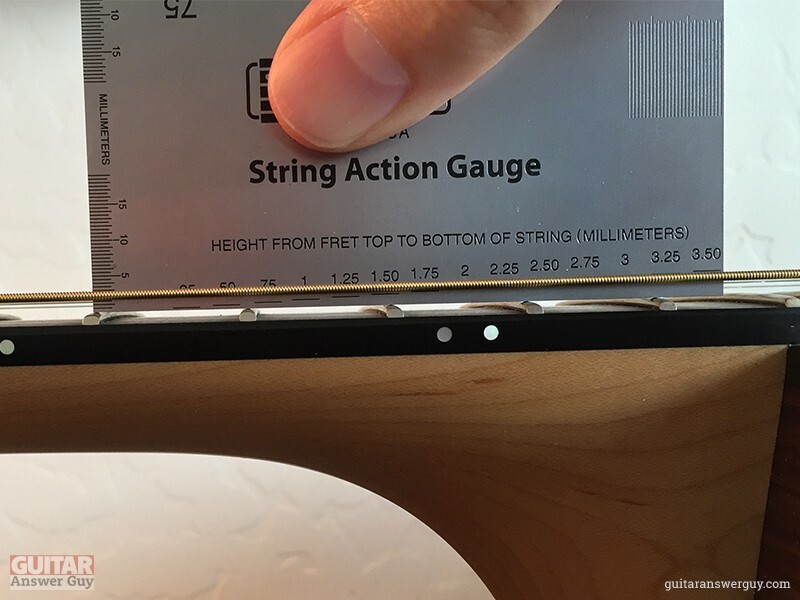 My StewMac String Action Gauge allows me to see precisely how high the strings are. Very high action can also cause issues with something we call “intonation.” Without getting into the specifics, suffice to say really high action can make notes and chords sound out of tune while you’re playing, even though you may have tuned the guitar perfectly. This is where “intonation” comes into play. When your intonation is messed up, your guitar will sound out of tune only while you’re playing. It can be just as maddening as fret/string buzz. This is the most common issue I find whenever I inspect a beginner’s guitar: the action is WAY too high when it doesn’t need to be. It’s no wonder so many new guitarists get discouraged and quit. It’s so dang painful and frustrating that they assume they just can’t do it. Additionally, most beginners use guitar strings that are way too thick, which just compounds the problem. This is why I always advise beginners use ultra light guitar strings, which I talk about in my article: Fingers Sore From Playing Guitar? Don’t Give Up, Lighten Up!. So, Should You Have High Action or Low Action? You need to be somewhere in between, but as a beginner you’ll want to be near the lower end of the spectrum. You want your action low enough that it’s reasonably comfortable to play, but not not so low that the strings buzz or fret-out (make no sound) unnaturally. Now, understand that some buzzing is normal, especially on electric guitars, and especially when you’re a beginner. Many factors determine how well individual guitars will tolerate low action, and cheaper guitars tend to buzz more than their high-end counterparts (though there are always exceptions). A skilled repair person (what we call a “guitar tech” or “luthier”) will be able to evaluate your guitar and set the proper expectations for you–just let them know that you’re hoping to get the lowest action possible without any (or much) buzzing. What Should You, the Beginner, Do Next? 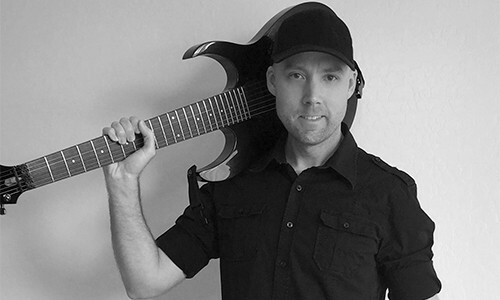 I encourage you to learn to do your own guitar setups–which includes setting action. However, this is something that can be challenging for beginners. It takes a little time, trial, and error to get right. So, in the meantime, take your guitar to a good guitar shop and tell them you want “a complete setup, with the lightest strings and lowest action possible, with minimal fret buzz.” They’ll know exactly what you mean and, as long as they know their stuff, will be able to have your guitar back to you in 1-2 weeks… playing and sounding as good as it possibly can. If you’d like to see what all goes into a “setup” and how you can learn to do them yourself, check out my article: Guitar Setups: What They Are and Why You (Might) Need One. Do you prefer high action, or low action? Or, maybe somewhere in between? Let me know in the comments section down below.